I am pleased to introduce to you all - Tejinder, a beauty and skincare enthusiast, who will be blogging on DB Reviews from time to time. Today she will be sharing a face mask review on the blog. Tejinder has also previously contributed articles on nail varnishes with some really lovely NOTDs. Let me not take up any more of your time and move on to Tejinder's review. 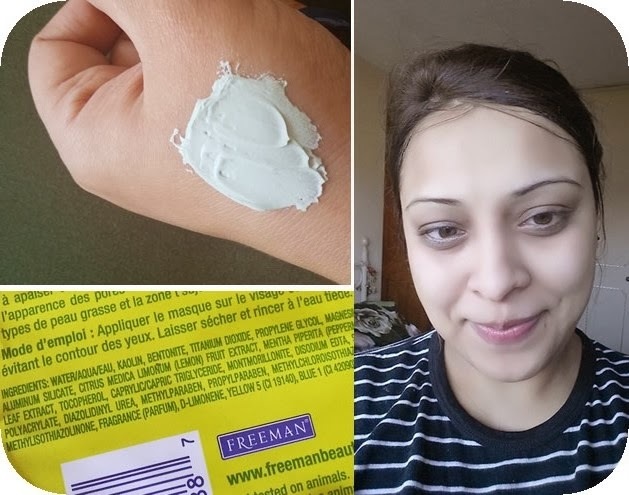 Hello everyone, today I am reviewing a wonderful product from Freemans which is made with natural and botanical ingredients and helps you look fresh and healthy. It is the deep pore cleansing mask and my first ever review of any face mask. 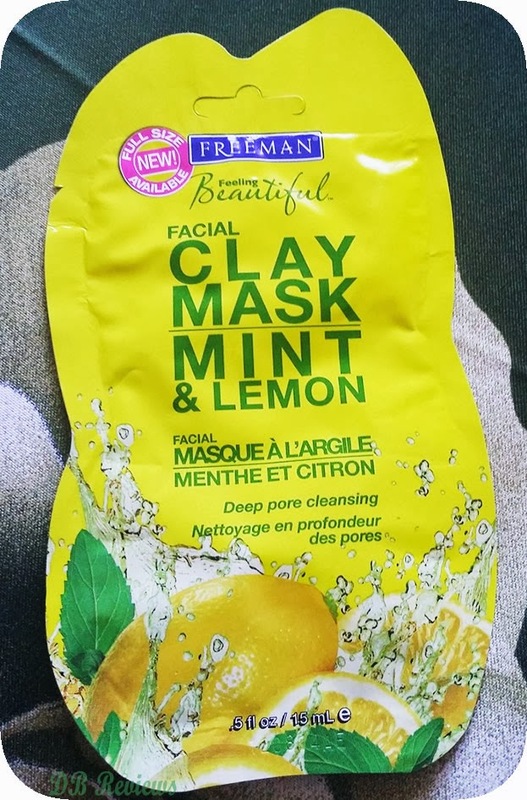 This clay mask enhanced with mint and lemon extract helps soothe and calm problematic skin. Perfect for the t-zone and oily skin types as it helps reduce the appearance of large pores and controls oil production. Mint extract, Lemon extract and Kaolin clay. Apply the mask to face and neck, avoiding contact with eyes. Let dry and rinse with warm water. Use it two times a week or more often for better results. This mask is a saviour for combination to acne prone skin as the lemony cool mask delivers relief from inflammation caused by breakouts. My friend who has oily skin had used this one with good results, so I decided to review it even though I have normal skin. Clay absorbs oil and reduces the large pores. The mask is amazing and quite affordable. I don’t have any acne on my skin but it brought a glow to skin by removing all impurities and making it look fresh, cool, soft and bright. It removed most of the blackheads too which was the main reason for me trying it out, so am very happy with the result. You can use this mask 3-4 times a week for good results. Texture of this mask is thick which takes a bit longer to dry but when it does, it feels a bit stretched on the face. Wash it off with warm water and feel the freshness. After washing it does not make the skin dry. It has a very mild lemon and mint fragrance which I loved. Having not used any of Freemans masks earlier, I am quite impressed. It dries out the pimples and works very well on the pores and makes them smaller. I love the packaging too as it looks very attractive in a yellow coloured sachet which can be easily used multiple times. *That is me after washing off the face mask sans any makeup. Final verdict: I am very impressed with this product and highly recommend it to anyone who has acne/oily/combination skin. One of the best masks which leaves your skin feeling very soft, cool, refreshed and bright. It is perfect for breakout prone and oily skin. Has a lovely fragrance of lemon & mint and works like magic on large pores. Quite affordable too, so do give it a try!!! I have tried freeman body scrub that was awesome, I will try to get hold oh this here. Nice review. Wow! Love how it makes your skin glow! I wish I could buy it! Oh this looks pretty good ! U must try this mask.. I have been wanting to try this out for awhile. Great review. Thanks for visiting my blog hun. I would like to try this mask!!! great review!!! I not tried these.. may be soon. I m sure u will love it ..
ohh fantastic review!! going to see if i can find this clay mask and try it out :) you have GORGEOUS skin!!! jealous! looks like a really good mask! wow.. teji u look so fresh!! loved your review as always.. long time.. how r u?? Hi supriya..I m good dear..actually been lazy these days as I m 24 weeks pregnant ..bus pehle my bro came from imdia then we went to spain on trip...bus nw got busy with job n my kiddo samar...but socha bhut ho gayee break need to go back in blogging world n start it again bus here I m ...how r u dear ?? I am great honey :) :* How about you ??? wow loved your pic without makeup tejinder! U are such a natural beauty! Thanks arpi...its really a good mask..u must try sweetie.. Thanks richa..this was my ist mask by freeman n i loved it.. Seeing first skincare product review by you di, loved it and you look so fresh in the pic. Nice review, dear. Mint and lemon extracts sounds very good to me! Great review love! I definitely want to try it out! Sounds like a great product. I also do not have any acne but still use those masks. Great review!